Wed., Aug. 15, 2018, 5:15 p.m.
LOS ANGELES – In Hollywood, even a 95-year-old celebrity isn’t too old for a facelift. The Los Angeles Memorial Coliseum is getting much more than a little cosmetic work done, however. The University of Southern California is just past the halfway point of a two-year, $300 million renovation project that will add dozens of modernizing features to the venerable arena that hosted the first Super Bowl and two Olympics – with a third on the way in 2028. But while the workers work throughout the fall and winter, the Coliseum’s annual show must go on. The Trojans and the NFL’s Los Angeles Rams are sharing the arena for the third straight year, and the festivities begin with a visit Saturday from the Oakland Raiders, who also called the Coliseum home from 1982-94. At least 15 football games will be played on this active construction site over the next five months, but USC and the Rams are determined to keep their homefield advantage. They’re also eager to let their fans know that while construction will limit the amenities inside the stadium and the available parking and tailgating opportunities outside, a little preparation can prevent them from going home unhappy. The university, the Rams and the project workers celebrated the halfway milestone Wednesday with a short ceremony outside the historic Peristyle end of the arena. 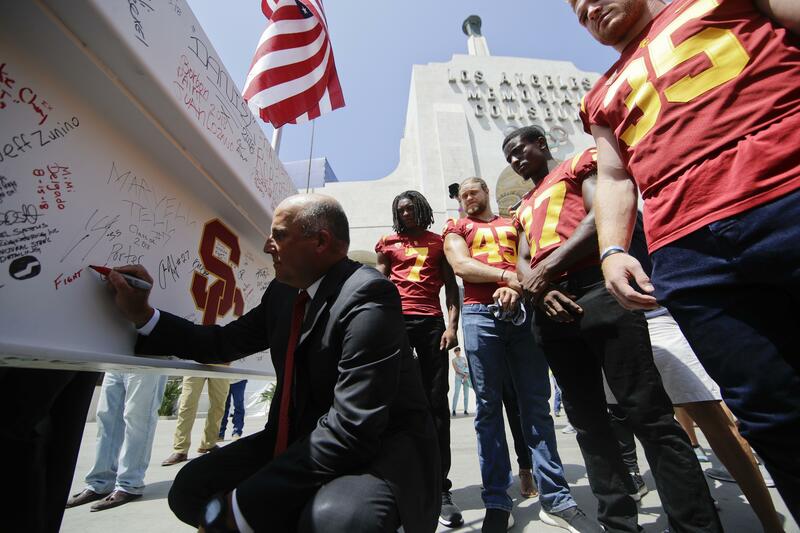 USC coach Clay Helton and a few Trojans signed the final steel beam that will go atop the seven-story tower rising on the stadium’s south side. During a news conference shortly before the ceremony, a succession of speakers representing the school and both teams encouraged fans to take public transit to the Coliseum this fall, or at least to make parking arrangements in advance. Among several changes to the usual game-day experience, fans won’t be able to walk all the way around the concourse during games, and the available concessions inside the stadium will be limited. But when the long-overdue project is completed for the 2019 football season, the imposing concrete oval that has hosted an incredible amount of Los Angeles’ sports history over the past century will be cleaner, more modern and more friendly. The Coliseum is currently a beehive of activity, with workers in yellow vests and hard hats scurrying around the bowl while two huge cranes loom above. Most of the work is being done on the south side, where 12,378 seats have already been replaced and a gleaming tower is rising to replace the arena’s now-demolished old stack of suites. The new tower will top its suites and press box with a 500-person observation deck. The project will be completed before the start of next season, when every tiny, antiquated seat in the Coliseum will be ripped out and replaced by modern seating with more legroom and fewer seats per aisle in many spots. USC already added new field and stadium lighting two years ago, and they installed new video boards and scoreboards for last season, when the Trojans won the Pac-12 championship and the Rams ended their 12-year playoff drought by winning the NFC West title. The Coliseum has packed in more than 100,000 fans to many big events over the decades, but its cavernous capacity will be reduced with the renovation. The capacity for 2018 is 78,467, and it will drop to roughly 77,500 when the project is complete next year. The Rams will get one season in the renovated stadium before they move into their own palatial new home in Inglewood in 2020. The Trojans will remain in the stadium they’ve called home since it opened in 1923. Published: Aug. 15, 2018, 5:15 p.m.